Part 2 of this series continues to guide us through the steps of a low-risk shift away from the monolith and towards a distributed system. Let's dive right in! In the previous post (part I), we set up the context for this blog. Basically, as we introduce a strategy to bring microservices to our architecture, we cannot and should not disrupt the current request flows. Our "monolith" applications typically provide a lot of value for the business and we must drive down the risk of negatively impacting these systems as we iterate and expand. 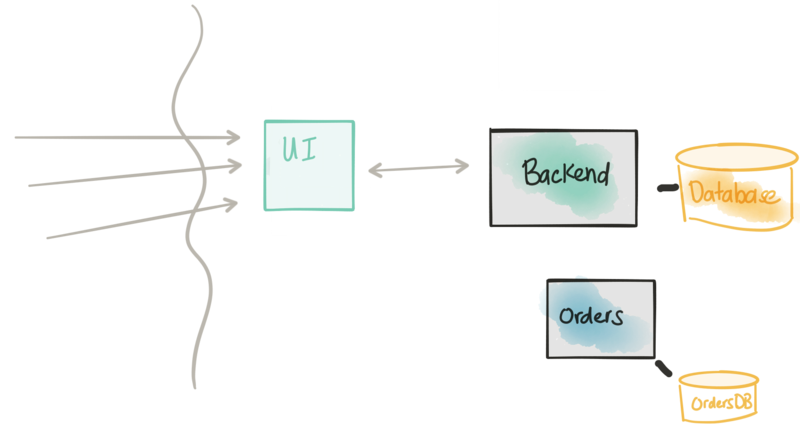 This leads us to an often-overlooked fact: when we start to explore a monolith to microservice journey we're going to quickly run into the undesirable, sometimes nasty parts that we cannot just wish away. I encourage you to go back and read the first part if you haven't yet. Also, go read the part about when NOT do microservices. If you'd like to follow along, the sample project I'm using is based on the TicketMonster tutorial on http://developers.redhat.com but has been modified to show the evolution from monolith to microservice. You can find the code and documentation (docs still in progress!) on GitHub. Let's go step by step through Part I and see how we can address each step. We'll also bring in the considerations from the last blog and revisit them in this context. 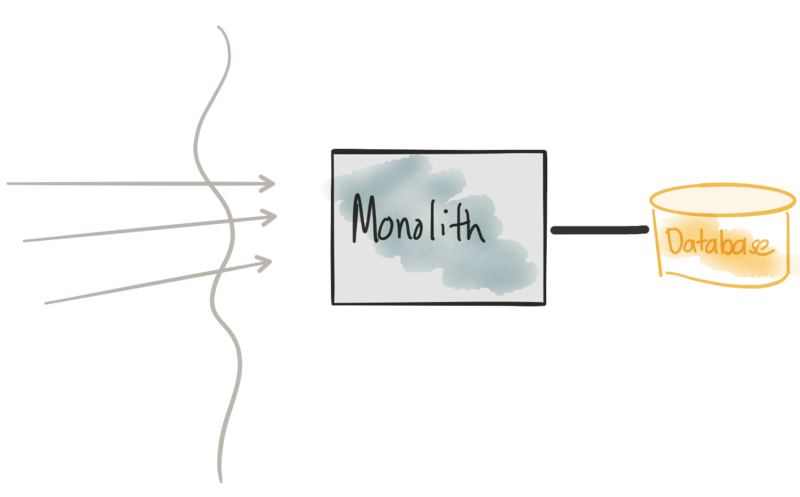 The monolith (code and database schema) is hard to change. We need to have lots of tests in place to catch regressions. 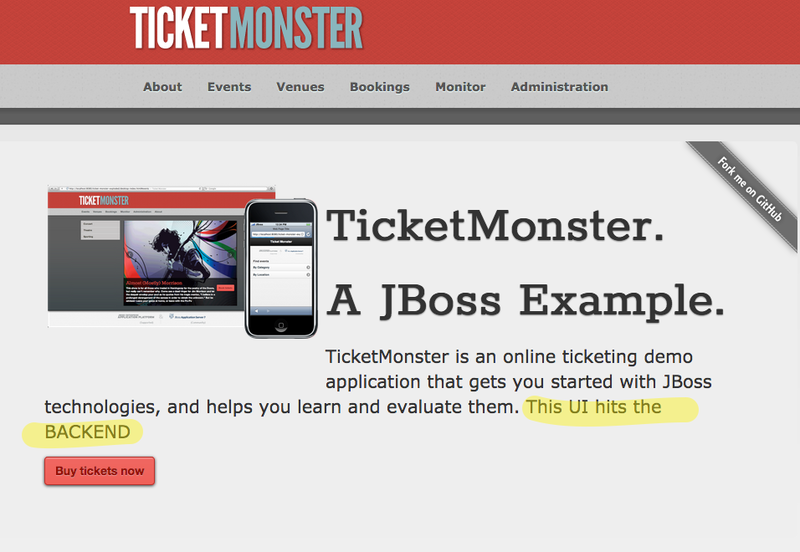 For a complete example, take a look at the BookingServiceTestfrom the TicketMonster monolith module. Kubernetes has become the de-facto deployment platform for containerized services/applications. Kubernetes handles things like health checking, scaling, restarts, load balancing, etc. For Java developers, we can even use tooling like fabric8-maven-plugin to automatically build our container/Docker images and generate any deployment resource files. OpenShift is RedHat's productized version of Kubernetes that adds, among other things, developer capabilities including things like CI/CD pipelines. Kubernetes/OpenShift is a deployment platform for your apps/services regardless of whether they're microservices, monoliths, or whatever else in between (with the ability to handle persistent workloads, i.e. databases, etc). With Arquillian, containers, and OpenShift pipelines, we have a solid way to continuously deliver changes into production. By the way... check out openshift.io that takes the developer experience even farther with automatic CI/CD pipelines, SCM integration, Eclipse Che developer workspaces, library scanning, etc. Don't modify the monolith for this first step; just copy/paste UI into separate component. We need to have a reasonable remoting API between the UI and monolith - this may not always be the case. 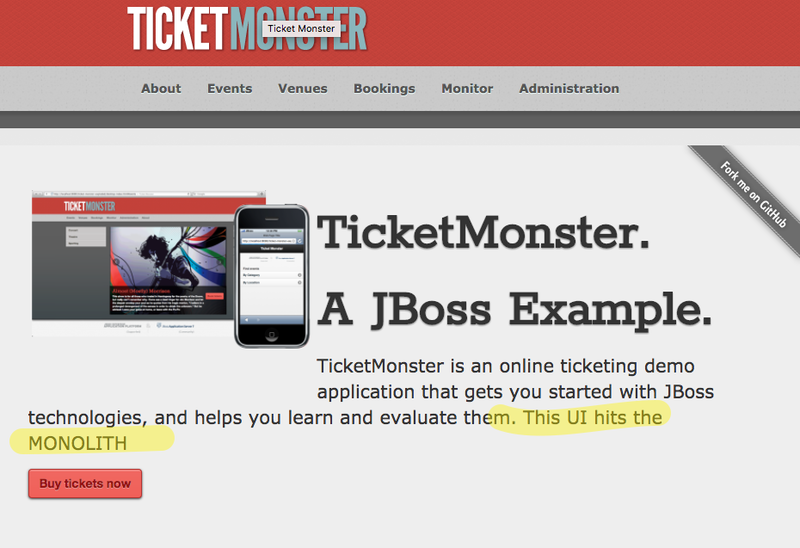 If we take a look at the TicketMonster UI v1 code we can see that it's very simple. We've moved the static HTML/JS/CSS components out to its own web server and packaged it into a container. This way we can deploy it separately from the monolith and make changes/version it independently. This UI project will still need to talk with the Monolith to perform its functions, so part of this evolution should be to expose a REST interface that the UI can interact with. With some monoliths, this may be easier said than done. If you're running into challenges with wrapping a nice REST API around the legacy monolith code, I highly recommend taking a look at Apache Camel particularly its REST DSL. An interesting part about this step is we don't actually change anything in the monolith. That code stays as is but our new UI gets deployed as well. 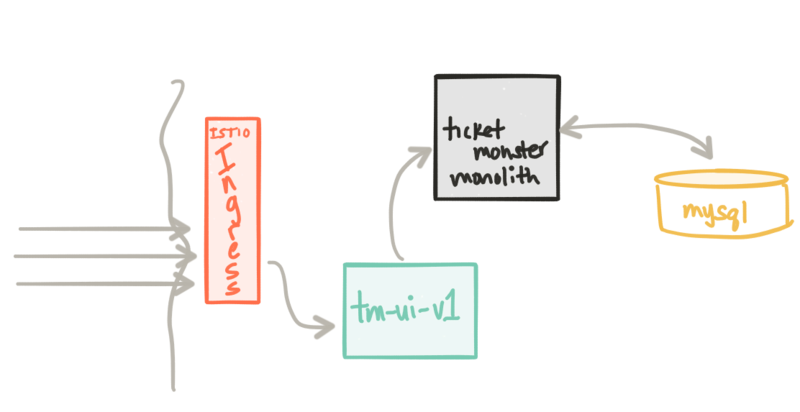 If we look in Kubernetes, we'll see two separate Deployment objects and two separate pods: one for the monolith and one for the UI. We use the kubectl CLI tools to port forward from our local box to a specific pod ( tm-ui-v1-3105082891-gh31x on its port 80 and map that to our local port 8080. Now if we navigate to http://localhost:8080 we should get to the new version of our UI (note the highlighted text indicating this is a different UI but that it points directly to the monolith). If we're satisfied with this new version, we can start directing traffic to this new release. To do this, we're going to use Istio service mesh. Istio is a control plane for managing a mesh made up of ingress points and service proxies. I've written a bit about service mesh and data planes like Envoy. I highly recommend taking a look at its full capabilities. We'll be iterating over this project as we go through the next few sections to explore Istio capabilities. If you're further confused about the control plane/data plane distinction, take a look at a blog written by Matt Klein which addresses that. Once we have the ingress in place, we can start applying Istio routing rules. For example, here is a route rule that says "Anytime someone tries to talk to tm-ui service running in Kubernetes, direct them to v1 of the service:"
This will allow us to more finely control traffic into and even inside the cluster. More on that in a bit. 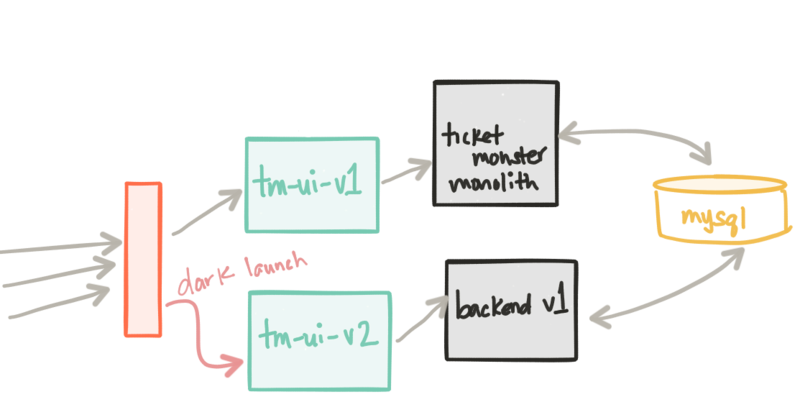 At the end of this step, we have all traffic going to tm-ui-v1 deployment which in turn talks to the monolith directly. Again we use a controlled routing/shaping approach to introduce this change without downtime. This step is fairly straightforward. We are updating the monolith by removing the static UI components from it (these have now moved to the tm-ui-v1 deployment). We may also make some API changes to this deployment as we've now freed the application to become a monolith service with an API that the UI can use and possibly other applications. Since we may make some changes to the API, we may also want to deploy a new version of our UI. In this step we have a deployment of our backend-v1 service as well as a new UI tm-ui-v2 that takes advantage of this new API in our backend service. At this point ticket-monster and the tm-ui-v1 deployments are taking live load. The backend-v1 and the UI that points to it, tm-ui-v2 take no load. One thing to note, the backend-v1 deployment shares the same database as the ticket-monster deployment since it's nearly identical, but has a slightly different outward facing API. Our new backend-v1 and tm-ui-v2 components have been deployed to production. This is a good time to focus on a simple, but crucial, fact here: we've deployed our changes to production, but we've not released them to anyone. The great folks at turbinelabs.io have a great blog that articulates this in more detail. We have an opportunity to do an informal dark launch. Maybe we want to unroll this deployment slowly to our internal users first or maybe to a subset of users in a particular region on a particular device, etc. Being able to "see" or "observe" the effects of this release is crucial and we'll talk a bit more about that later on. Also note, this canary release approach is currently being done at the edge of our architecture, but inter-service communication/interaction can be controlled with istio for canaries as well. In the next few steps, we'll start to see that. 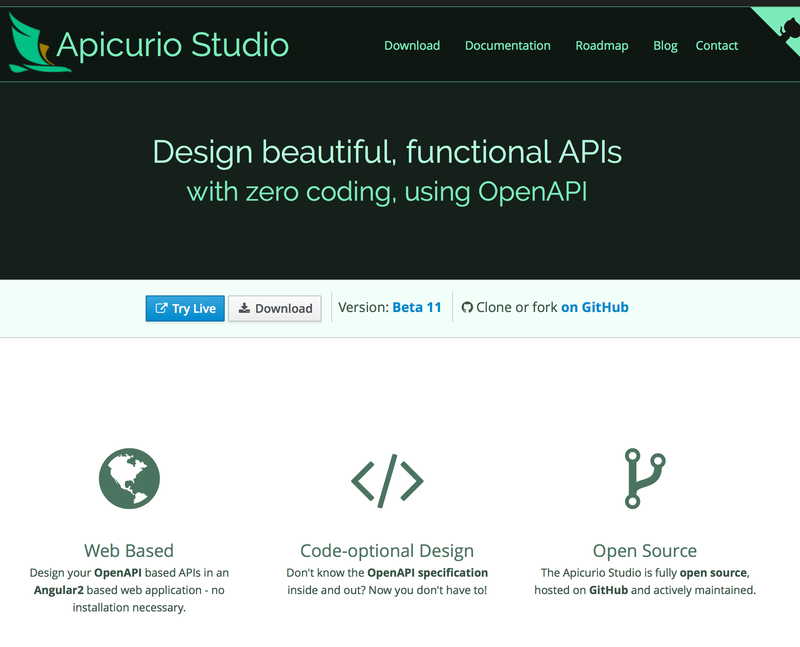 If we're building a greenfield API, or trying to imagine what our API looks like after iterating using a domain-driven design approach, we can use apicur.io tooling to build a Swagger/Open API spec. 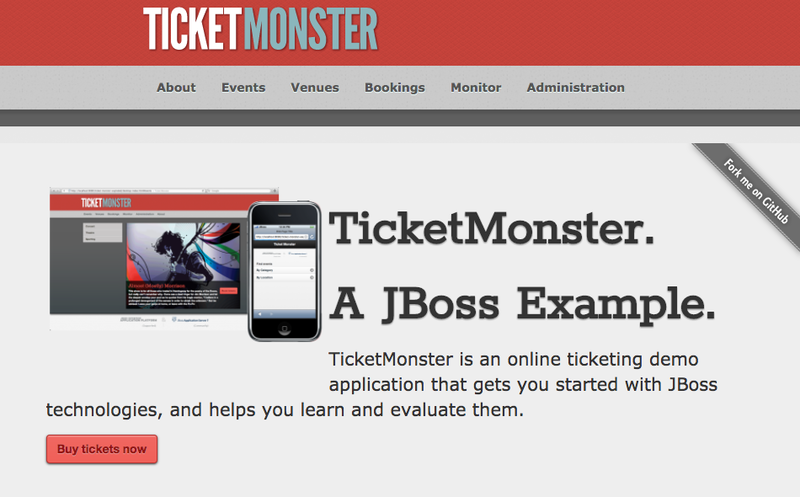 In the case of TicketMonster, We used Hoverfly to capture traffic from our application to our backend services by starting hoverfly in proxy mode and capturing the traffic. We can easily set an HTTP proxy in our browser settings to send all traffic through hoverfly. This stores the simulation of each request/response pair in a JSON file. From here we use the request/response pairs in a mock or even better, use them to start writing tests that codify behavior we want in our implementation. For more information on testing Java microservices, check out this awesome book from Manning called "Testing Java Microservices" from some of my colleagues Alex Soto Bueno, Jason Porter, and Andy Gumbrecht. 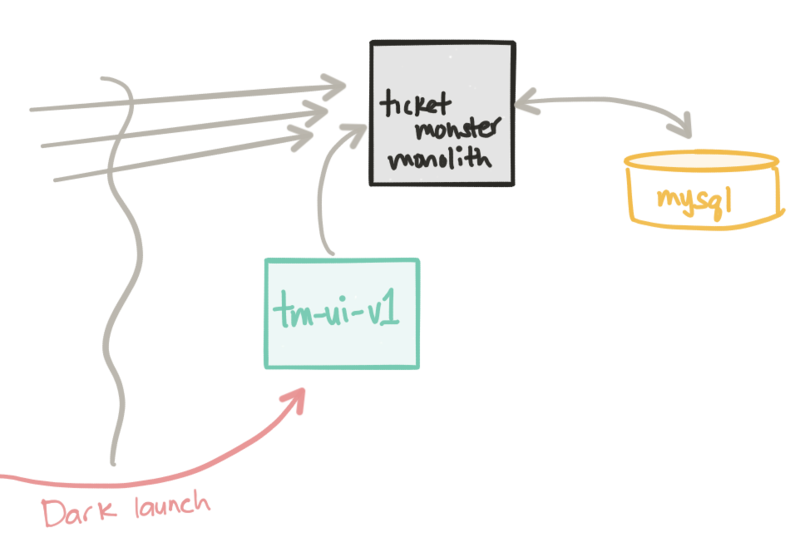 As this blog post is already getting very long, I've decided to split out the last parts to Part III which deals with managing data between the monolith and microservice, consumer contract testing, and how to do feature flagging/more complex istio routing, etc. Part IV of this series will show a recorded demo of all of this in action complete with load simulation tests and fault injections. Stay tuned and follow along on Twitter!